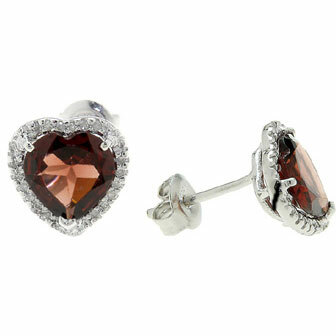 These heart-shaped garnet earrings are a combination of beauty and exquisite design. A 925 sterling silver base is beautifully crafted and mounted on a strand. Each earring has a double layer base with the upper layer being slightly larger to accommodate the 3.40 Carat heart-cut garnet gemstone. The gemstone which measures 8mm x 8mm in size, is further surrounded by 0.11 Carat diamonds. These diamonds combine luster to project a halo effect in consonance with the garnet gemstone thus making the stud earrings simply irresistible to the eyes. Given its heart-shape and heart-cut of the gemstone, this earring set is a perfect gift for any lady of great taste. We guarantee our Heart-Shaped Garnet and Diamond Halo Stud Earrings in Sterling Silver to be high quality, authentic jewelry, as described above.